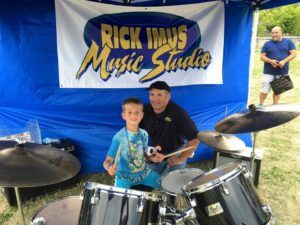 Rick Imus Music Studio returns to run 30 Second Rock Star at FirstOntario Centre for the Arts in Milton on Sun Sept 30. The free event will be staged in the studio theatre, MinMaxx Hall, and will be part of the national arts campaign, Culture Days. The Milton hub is hosted by ArtsMilton. Participants will try their hand (both, actually, plus feet) at playing drumsets in both freestyle and band settings. Staff and friends from the studio will be on hand to accompany on guitar, piano, or ukulele. Drum sticks will be provided and teachers will be available for quick tips. The event runs from 10:00AM to Noon and is followed by friend of the studio, comic magician, Jason Palter.